When there is an act of violence or an implied threat of violence, our well-trained team moves quickly through an in-depth evaluation process in partnership with the Gladstone Police Department, the Clackamas County Sheriff’s Office, the Department of Human Services, and the County Juvenile Department. This team follows a manual that is kept confidential to avoid giving individuals who make or pose threats tips to evade our process. 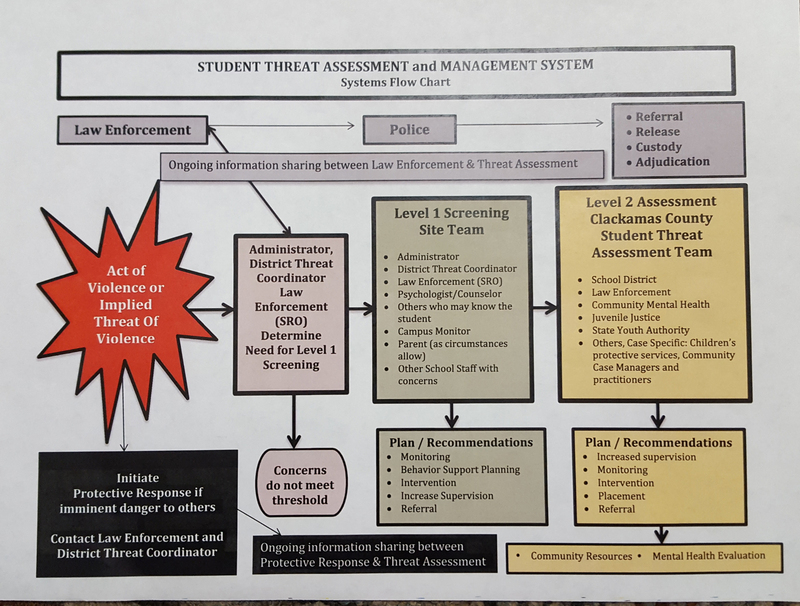 Student discipline processes run parallel to the threat assessment process. Due to student confidentiality laws, the district cannot reveal discipline outcomes, but trust that we take each threat seriously and will take appropriate action to keep students safe. This flow-chart provides an overview of the process.